A new online service developed by electronics giant NEC offers carbon-conscious households a fun and friendly way to keep tabs on their energy consumption, as well as that of their neighbors. Developed in conjunction with major Internet provider BIGLOBE, the service -- called "Carbon Diet" -- includes an easy-to-install wifi-enabled device that attaches to the home circuit breaker and measures power consumption via electric current sensors. The collected data is then periodically transferred to the home computer using a ZigBee wireless link and sent to an online server for processing. Users can log on to the Carbon Diet website to check their daily and hourly energy consumption and see how they rank in comparison with other participating households. Users can also see how their monthly carbon footprint compares with the same month of the previous year. Based on the degree to which users actually reduce their carbon emissions, they are awarded "eco-points" that can be exchanged for virtual soil, water, flowers and grass in a nature restoration simulation game. 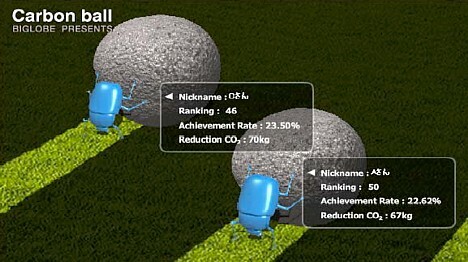 Participants can also view their progress in the form of a game called "Carbon Ball," which features dung beetle avatars in a "carbon ball" rolling contest. The distance each household's dung beetle travels is based on how successful they are in reducing power consumption. The game is designed to instill a sense of competition to keep users motivated and focused on reducing energy consumption. For now, the three-month trial service is being conducted in the homes of 100 NEC employees. After the trial, NEC and BIGLOBE will work with Ex Corporation (an urban and environmental planning and consulting firm) to analyze the data and develop business models for local governments and the private sector. The company is aiming for sales of 2 billion yen ($20 million) over the next 3 years. the pic reminded me so much of this game. What if you don't have a circuit box, but rather a fuse box? Does it work with that? what if you have neither (ex: in an apartment)? Can it be rigged to work with a Kill-a-watt? Also, be sure you generally clean of sodium as soon as you’ve utilised it within sodium mineral water. If the salts usually are not washed away, on time they will crystallize; action as sands and bring about leaks for your camera case. In cases when sands seem to get into the case, they are much better washed away with avenues connected with mineral water.